Isiah Factor | The Insite » RESULTS OF RED LIGHT CAMERA STUDY RELEASED! RESULTS OF RED LIGHT CAMERA STUDY RELEASED! 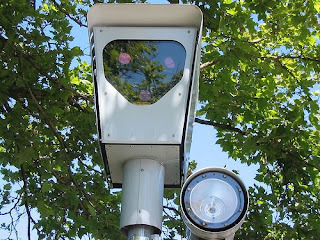 December 29, 2008 | Posted in Uncategorized | Comments Off on RESULTS OF RED LIGHT CAMERA STUDY RELEASED! DO YOU BUY THIS PRESS RELEASE FROM THE CITY? Researchers today released a final study of the City of Houston’s red light camera program concluding that the cameras are “mitigating a general, more severe increase in collisions,” at intersection approaches without cameras. The study also concludes that, “the proportion of collisions occurring at monitored approaches [with cameras] decreased significantly relative to the non-monitored [without cameras] approaches,” after the program began. The study, conducted by researchers for the Center for Civic Engagement at Rice University in collaboration with the Texas Transportation Institute at Texas A&M University, compares data between intersection approaches with cameras and those without cameras, both before and after the program was initiated. Between September 2006 and August 2008 cameras were installed at 50 intersections and 70 approaches in five groups of 10 approaches and one group of 20. “As the study points out, when we compared non-monitored to monitored approaches before and after the cameras, we see that non-monitored approaches have observed an increase in collisions that is not observed at the monitored approaches,” said Tim Lomax, research engineer and mobility analyst with the Texas Transportation Institute.